Hi! 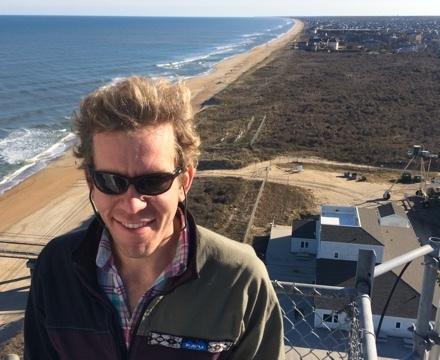 I’m an oceanographer with the U.S. Geological Survey based in Santa Cruz, California and previously in Woods Hole, Massachusetts. I received my Ph.D. from the School of Oceanography at the University of Washington in Seattle. My M.S.E. is in Civil & Environmental Engineering, also from the UW. Previously, I was a hydrologist at the USGS’s National Research Program in Reston, VA. I was born and raised in the state of Maine. Generally, I am interested in the sediment transport and morphology of coastal and riverine systems. I’m currently involved with studies in Puget Sound, WA; Jamaica Bay and Great South Bay, NY; and Grand Bay, AL/MS. Past study sites include the tidal Amazon River, Brazil; the tidal Mekong River, Vietnam; Willapa Bay, WA; the Columbia River, WA; and the Florida Everglades, among others. I’ve also been part of studies on the New Zealand continental shelf and other interesting places around the world. In addition to these active field programs, I use numerical models to answer questions about sediment transport, wave interaction with vegetation, coastal vulnerability and resilience, and more. These models include SWASH, SWAN, ROMS, Delft3D, and junky little hand-coded numbers. I perform data analysis primarily within the scientific Python stack. Some of my computing interests lie in data standardization, distribution, and reproducibility. A portion of the code I have written as part of my work at the USGS is available on GitHub; I have contributed code to a couple of open-source projects including xarray. I used to use MATLAB quite a bit, and you might find some useful snippets on my MATLAB codes page. My C.V. is available here (updated April 2019); feel free to email me at dan @ this domain.